LENNIE: Think you mean luo han fruit, which botanically is Fructus momordicae, Morordica grosvenorii, or Siraitia grosvenorii. It is also known as Arhat Fruit, an item that grows as a climbing vine. At one time this fruit was used as a sugar substitute, that was when sugar was in short supply. Most research tells us it originated in Guangxi, though we once did read it was from Guilin. It looks like a thin-skinned dried ball, is brittle, and is popular among southern Han Chinese and several minority populations. They like to use it for soup and as a beverage, especially when ripe. This herbal medicine it is often given to singers, said to cure coughs, clear out the lungs of sputum, and it is something recommended to reduce blood pressure. We did hear that a Yao nationality herbal practitioner first reported using it; thus it was named after that doctor, Luo Han. Another tale is that Zhong ethnic peoples used it for many generations; they call it Buddha’s Disciple Fruit or luo han guo. There are many newer cultivars called chang tan guo, la jiang guo, dong gua han, and qing pi guo. 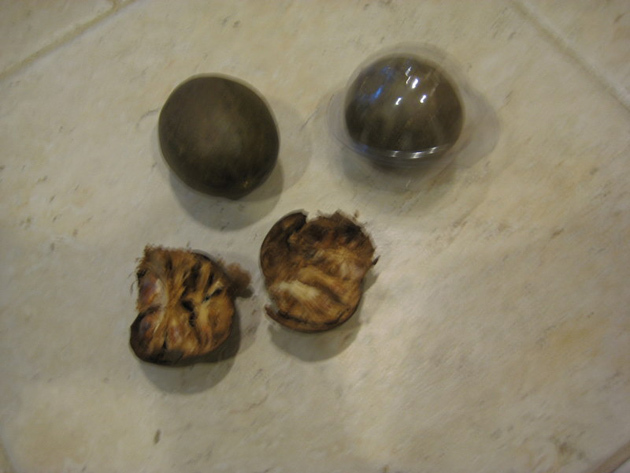 In English, these are called: Changtan fruit, Lajiang pear, King Luohanguo, and Green Ball, respectively. Green Ball is the one most widely cultivated. In markets, one finds this fruit sold solo or in twos or threes. Note its plastic shipping wrap, the one featuring its outside, and another broken reveals what it looks like within. When selecting dried ones, the ripe ones are more brown and sweeter, so keep that in mind. Do the Chinese have dragon recipes; and if so, what food(s) do they use for them? BERNIE: Yes, there are some recipes named for that honorific food. I have seen recipes for Dragon Soup in ancient Chinese Almanacs, and I did once hear there was one called Dragon Rice. Sometimes, these foods are philosophical. In Dragon Years one does find fiery/spicy dragon-named recipes for New Year festivity use. There are chicken dishes for Chinese New Year in the Year of the Rooster, pork dishes for the Year of the Pig, etc. Here are two recipes for dragon dishes, even though this is not the Year of the Dragon. I note that in several issues, you write about thousand year eggs. Can they be made at home? We live hundreds of miles from a Chinese market. HENRIETTA: Once read a recipe in a Kenneth Lo cookbook, but I have never made them. Do recall they used duck eggs, salt, ash, and lime, and contrary to what I have read elsewhere, they took a month and a half, not the usual one hundred days. Suggest you get to a library and locate that book, it is titled: The Chinese Cookery Encyclopedia. Ask a librarian to get you a copy on interlibrary loan if they do not have it. Write us in a couple of months advising how they turned out. I am going to study in Israel for a year, have an apartment arranged for where I will be doing my own cooking. Are there Chinese grocers where one can purchase ingredients to make Chinese food? AARON: For starters, in any city, suggest you begin by checking past issues and the index listings on our website. Then call places mentioned as they can be of more current help than can we. Also, call local embassy or consular offices and ask about any Chinese restaurants, stores, etc. Do ask Chinese folk you meet on the street, as well. As a student, be creative and clever, surely you will find one or more. There are probably small places and queries at each of them can lead to others. To get you started in Tel Aviv, go to International Food Products at 48 Levinski Street. Their other location is at 6 Rosh Pina Street in the same city. I was there in 2009 and they gave out calendars; it is from one of these we advise of these addresses. Heard of a Chinatown that does a restaurant tasting, in which country, which city, and why? MARY: The Big Apple, that is New York City, did do an annual event called 'A Taste of Chinatown.' It helped revitalize this region devastated by the 9-11 attack. However, as did many things American, the organizers and sponsors had budget cuts and so it is no more. Do hope you talk to your congress people to reverse that decision because it was an exciting event. Did go to several of them; they began in 2004. Some one hundred fifty thousand came the last year they were held. For a dollar or two, anyone could sample Cantonese, Sichuan, Fujianese, Shanghainese, Taiwanese, Buddhist Vegetarian, and many other Chinese cuisine offerings. A couple from Germany and a gal from Japan came to Chinatown with three friends from Chicago. We met them when they asked directions and then they spent some time following me while my husband was on line for a duck carcass. His long wait was to buy a two-buck bone from a duck. It was worth it. This carcass had lots of meat still attached, and when we came home, we made a magnificent duck soup. Incidentally, those ladies said many foods looked alike and they knew not what to sample, and that was why they followed me. Did explain some differences and they and others listening learned that visuals can deceive, differences can be subtle or substantial. Shared tastes of the foods I was holding; they said they were savory and super. Sent them off to check out many of fifty-plus places selling others. It is a pity that Bank of America, CBS2, the Lower Manhattan Development Council, and other sponsors put their diminishing bucks elsewhere. The Chinese restaurants are still there and still serving a plethora of fine Chinese dishes. Suggest you and others find some friends and sample dishes on your own. Half dozen of you can share many dishes for but a few bucks each. And, while in Chinatown, check out the new Maya-Lin-designed marvelous Museum of the Chinese in America; 215 Center Street. It is a block uptown from central Chinatown and Canal Street. 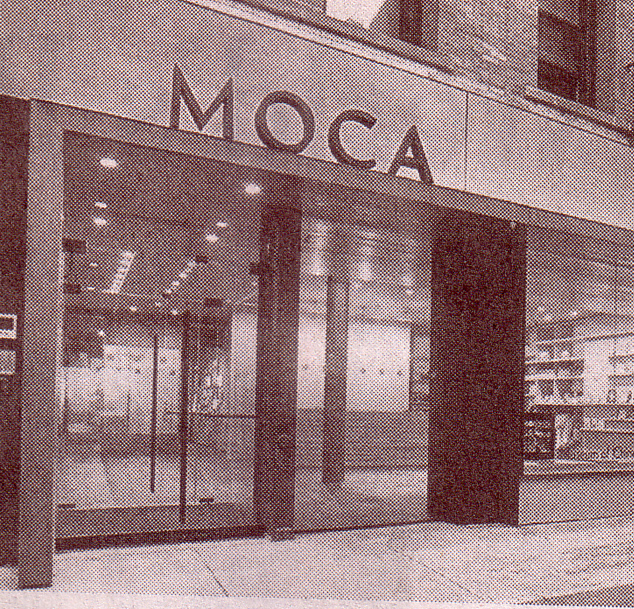 This new gem, the only professionally staffed museum dedicated to reclaiming, preserving, and interpreting the history and culture of the Chinese and their descendants in the Western Hemisphere, was founded as the 'New York Chinatown History Project' by John Tchen and others. It outgrew its Mulberry Street beginnings and is flourishing in new digs. Look at the exhibits and the growing number of books and artifacts; buy some to feed your mind! Learn that almost three-quarters of New York City’s Chinese are foreign-born, almost forty percent live in Queens, about thirty-five percent in Brooklyn, and a few percentiles less than a quarter of them live in Manhattan. 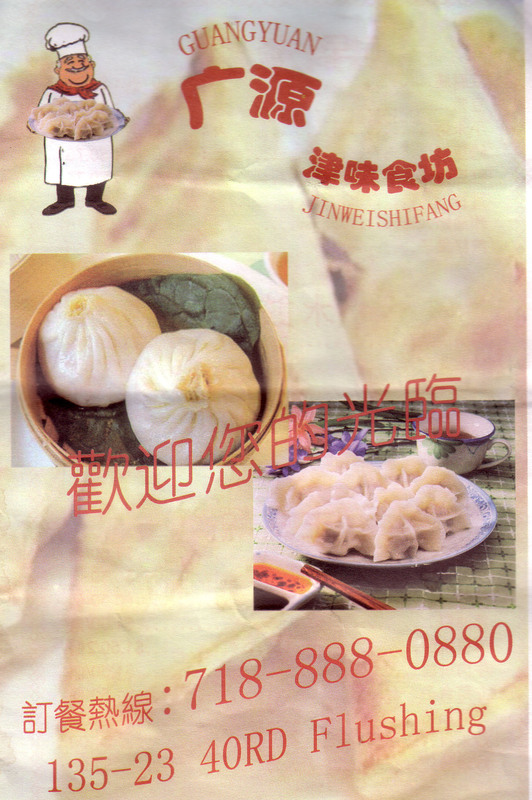 Then visit the outer borough Chinatown locations, too. Want more info, contact AAFNY; 120 Wall Street, 3rd floor, NY NY 10005 or call them at (212) 344-5878 and learn as we did that most Chinese came to the United States in 1990 or later. More than one million Chinese live in the USA, forty-five percent of all Asians in the USA are Chinese, two-thirds of Chinatown residents are Asian, ten percent of the rest of the city is, too. And, there are almost four thousand Chinese businesses it this city, more than two hundred fifty Chinese restaurants just in Manhattan's Chinatown, etc. Have searched many Chinese dictionaries, can not locate the Chinese word for salad; can you help? RED The only word we found was sela, also spelled shala. In fact, there are many liang cai or cooked cold dishes served in quite a few of China's provinces. They can be seasoned with vinegar, sesame oil, fresh ginger, etc. When I began asking Chinese friends, almost all indicated the reasons are for sanitation or health. Lettuce, the base of most of the world’s salad dishes is used in China, but most often it is cooked. After all the letters, is a typical Chinese cold dish. 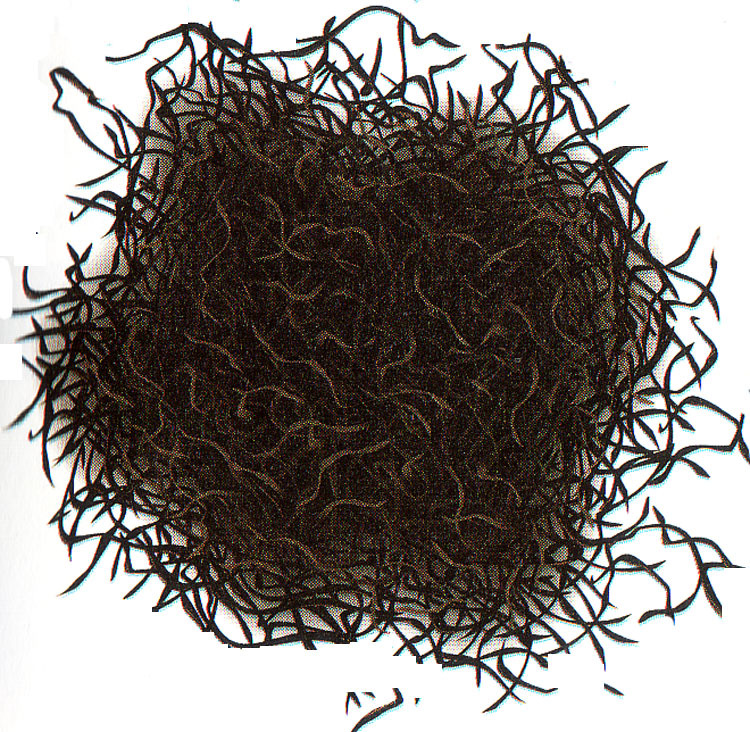 Read about one Chinese treasure food, ‘hair seaweed.’ Are there any others? Can you also advise why they are considered ‘treasures? BETSY: There are five such treasured items; three related to food; and they are yellow, red, and black treasures. Yellow Treasure is gan cao, also called guo lan. Botanically it is Glycyrrizae uralensis, commonly known as licorice root. It has a yellow to tan exterior and it is believed sweet and neutral. It is said to enter all twelve channels, principally the heart, lung, spleen, and stomach. This Chinese herbal, sometimes called 'the king of herbal medicines' has many medicinal uses including that it nourishes the stomach and the spleen. In addition, it relieves coughs and reduces fevers, and it moderates spasms and it can alleviate pain. Red Treasure is guo qi and, botanically called Lycium barbarum, also Lycium chinense. In the past, this was known as the wolfberry or medlar, but now is better known in English as the goji berry. Sweet and neutral, this fruit of the matrimony vine enters the body via the liver, lung, and kidney channels, and is said to nourish these organs, and treat liver and kidney deficiencies. Said to enrich the yin it moistens the lungs and helps relieve coughs. In addition, reported use includes treating stomach pains, impotence, thirsting disorders, and nocturnal emissions. Black treasure is fa cai, and in some ways looks like hair. Cookbooks often refer to it as 'hair vegetable' or 'hair seaweed.' Many correctly saying that it is algae. Its Chinese name in homophonic for 'making a fortune' or 'be prosperous' so it is popularly eaten on New Year's day wishing for same. Used as a gift for guests and in a dish called Buddha’s Delight or a variant name thereof, botanically it is known as Nostoc flagelliforme. This food and medicinal is believed good to stem bleeding, reduce hypertension, and stimulate digestion. It is to nourish the intestines and the stomach, used for related deficiency diseases. A friend advised that there is a famous boneless duck recipe with minced chicken stuffing. Have you ever heard of this dish; and can you locate a recipe for it? CECEIL: This dish was an Imperial one in the last or Qing Dynasty. It is topped with sesame seeds and on the bottom is a layer of minced chicken mixed with sesame seeds, water chestnuts, etc. Below is an easy one, but it does take lots of time. Spelling of Chinese place words, among others, confuses me making me unsure as to where a recipe really comes from. Finally caught on that Beijing is Peking and that Shanghai does not change its spelling. Can you advise about important location names? Some provincial spellings remain the same, examples are Liaoning, Hunan, Shanghai, and Yunnan. Incidentally, Taiwan remains Taiwan, as well. From HILLIE via e-mail: Some issue back you wrote about konnyaku, but really what is this Japanese food? That, and how do the Chinese use it? HILLIE: Most often this gelatinized food is cut into squares, rectangles, or noodles after it is mixed with the flour of the tuber Amorphallus konjac, then mixed with plain water and limewater. After it sets and thickens, they cut and shape it as desired. Yes, the Japanese do eat it often; once read in a 1930's item that they do so once or twice a week, but they are not the only culture that does. They and the Chinese, for example, most commonly cook some with meat such as beef or chicken, sometimes with vegetables. They season it with sugar and soy sauce. The Japanese and the Chinese like konnyaku mixed with vegetables, bonito, dried shrimp, and/or tofu. Many use this food for weight-reduction. How often the Chinese use it and the many ways that they do is not known. Perhaps you can do more investigation and can advise us and our readers. Waiting for your thoughts on Kenneth Lo’s daughter’s place in London; and London Chinese food in general. Did you not get there yet? And two questions. 1) Do the Chinese really eat scorpions; and 2) can one purchase seaweed as a powder for use in drinks, dishes, etc>? Betts: In general, Chinese food has expanded and improved in London, not so many other places in the UK; but perhaps it will very soon. It is not related to what one chap printed which was "It was the best Polish food I ever ate." His statement may be humorous but surely is not accurate. 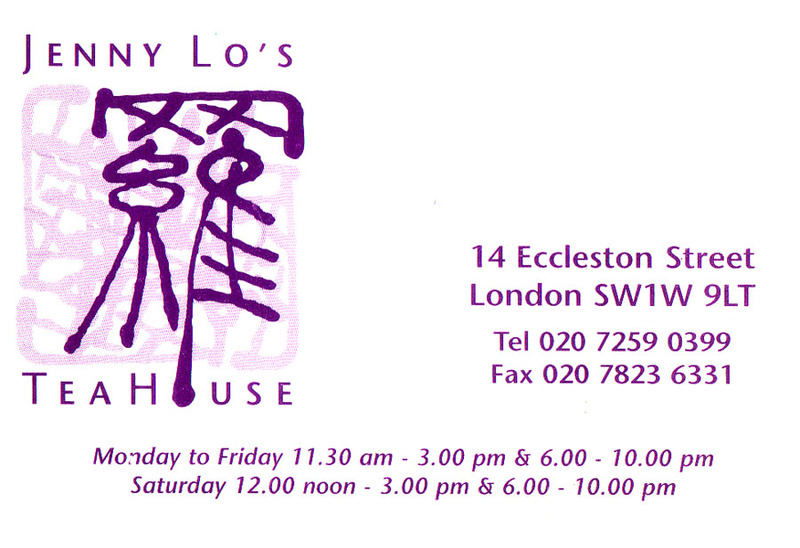 As to your first question, at JENNY LO's TEA HOUSE; 14 Eccleston Street; London SW1W 9LT; phone: 020-7259 0399, we were impressed that virtually every seat was taken at lunchtime, disappointed that it was almost empty at dinner time. At one lunch we had Long-cooked Pork with a reasonable supply of carrots, onions, and snow peas and not too much pork. Our Mixed Seafood included prawns and scallops which were excellent, the squid was tough, the black bean sauce bland. We did like looking in to the open kitchen, also sitting at the black tables. However, with only twenty-eight seats, why does no one pays much attention after taking your order? Case in point: A dining neighbor dropped a chopstick, bent over and knocked over his teacup then waited about five minutes for a waiter to arrive who did not notice or hear his faux pas. As he was flagged down, he asked, "do you need something?" Now, as to powdered seaweed, our supermarket had none, one a few blocks down did not, either. However, in London there was one selling green agar-agar powder. Its picture indicates one can purchase red, blue, and yellow, only green was available here. Overheard you and some guy in Guangyuan, a tiny eat-in/take-out talking about scotch eggs. Tried to figure out how this British food was connected to Chinese cuisine. Noticed you take a menu and after you and some other folk left, turned it over and saw that this very place was serving them. Tried to ask them where they came from, but they never heard of Scotch eggs and even after I pointed to them on their menu, language differences made conversation almost impossible. Why does Guangyuan serve them? KENNY: We wondered the same thing, and on a return trip, learned their English of little help getting that very answer. Incidentally, the business card says Guanyuan, they speak little English, and they have no idea these stuffed meatballs are a British food. They told a Chinese-speaking customer there helping us when we were attempting to learn about this item illustrated on the menu that a neighbor taught them to make them, and yes, he was not Chinese. The interpreter and some Chinese friends had never seen these meatballs stuffed with hard-cooked eggs anywhere in China. 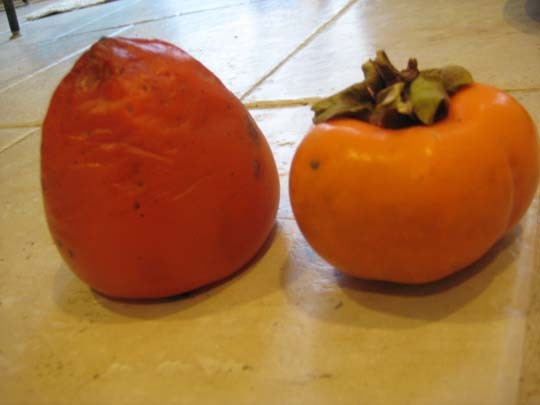 Do the Chinese eat the Japanese or the other persimmon? 1. Put all ingredients in a pot with ten cups of water and just bring this to below the boil, then simmer it for one hour. 2. Remove the lou han, then serve. 1. Heat oil in a small soup pot, and fry the white parts of the scallions until they are about ready to brown. 2. Add all other ingredients but not the green scallion parts, and bring to below the boiling point, and reduce the heat and all this to simmer for ten minutes before adding the green parts of the scallions. 3. Pour into individual bowls, and serve. 1. Cut shrimp in half the long way, but not through the tail section and not all the way through their flesh; then gently pound to enlarge this one piece of shrimp; repeat with all the shrimp. 2. Dip each shrimp in egg, then the cornstarch, and shake off excess cornstarch, and set aside for half an hour until cornstarch is thoroughly wet. 3. Heat oil, and deep fry half the coated shrimp until lightly browned, remove from oil and drain on paper towels. Repeat with the other half of the shrimp. 4. Put hot sauce in small bowl, then serve shrimp so that everyone can dip theirs into the hot sauce holding the shrimp by its tail section. 1. Cut bean curd sticks in half the long way, then into one-quarter-inch pieces. 2. Put bean curd pieces and the peanuts into a small pot of water, bring to the boil, reduce the heat, and simmer for five minutes, the bean curd should have no hard part left. Remove with a slotted spoon and set aside in a small serving bowl lined with a paper towel. 3. Add star anise, Sichuan peppercorns, celery, carrot or goji berries and simmer that for three more minutes, then drain and add to the bean curd mixture. Using a paper towel, dry the solids in this bowl then add sesame oil, salt, and black vinegar. Stir well, then refrigerate for one to two hours. Serve cold. 1. Cut duck in half, head to tail, clean and remove any entrails, and dry with paper towels. 2. Bring four quarts of water to the boil in a large pot, and boil the duck, scallions, and ginger for five minutes, then remove the duck, discard the scallions and the ginger, and steam this over two cups of boiling water for half an hour. Remove the duck, cool it, and when able to handle it, remove all the bones including those in the legs and one-bone wing sections, and discard them. Pour the water from the bottom of a steamer and that in the large pot into another pot and reduce by half, then use it for soup or another use. 3. Mix the wine, minced chicken, egg whites, minced water chestnuts, cornstarch, salt and pepper, and half the sesame seeds. Spread this on the underside of both halves of the duck, and spread the rest of the sesame seeds on the top or skin-side of the duck. Set aside for half an hour to dry somewhat, then cut each half in half. 4. Heat the oil in a large flat-bottom pan and fry the duck, one piece at a time, until crisp. Remove and cut into one-inch wide strips and set on a serving platter. Complete until all sections of the duck are fried, then serve.